This nail art is all free-hand, so you need a very fine nail art brush to achieve this. I believe it is called a "striper brush", since it creates very fine stripes? Anyways, I think this nail art came out okay, I can't say it is my favorite out of all the ones that I have done. But nonetheless, let me share it with you. Paint your nails with white polish and allow it to dry. 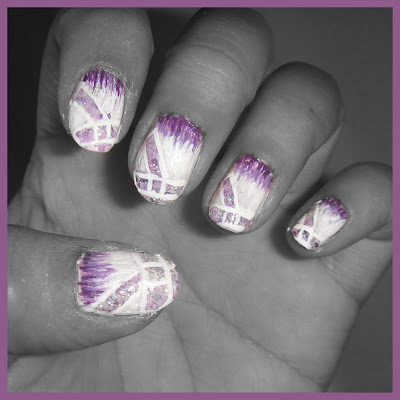 Use a striper brush and three shades of purple nail polish to create a camouflage pattern in a shape of a french tip. Then create a diagonal camouflage rectangle that will represent the hanging part of the bow. Place glitter nail polish on top of the boy only. This is to imitate the fine details of the flowers in the bow of the actual dress. Finally, use your striper brush, dab it in white polish and, outline the bow. For the fringe, start of the bottom of the nail and stripe several dark purple. A little above the darker purple, use a lighter shade of purple and create more stripe. Finally use the white polish to create the white fringe above the lighter shade of purple. Make sure to fill in the remaining white space.